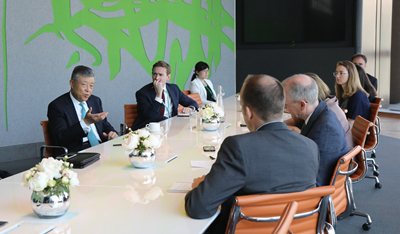 On May 8, Ambassador Liu Xiaoming visited Bloomberg's European headquaters and had a talk with David Merritt, European News Director, Simon Kennedy, Executive Editor for global economics, Marc Champion, Senior Reporter for International Affairs, Stuart Biggs, U.K. Government Editor, Elisa Martinuzi, Managing Editor for Finance and Investing, and Anchalee Worrachate, Markets Writer. Ambassador Liu said that, over the past 40 years of China's reform and opening-up, China-UK relations have made strong headway. President Xi Jinping's successful state visit to the UK in 2015 ushered in the China-UK "Golden Era". In recent years, China and Britain have made steady progress and achieved fruitful results in the "Golden Era" with ever-closer political contacts, rapid development of economic and trade relations, and ever-deepening cultural and people-to-people exchanges. In the context of Brexit, China-UK cooperation on economic and trade faces both opportunities and challenges, with opportunities far outweighing the challenges. The two sides should seize the opportunities to achieve mutual benefit and win-win results. Regarding China-US trade dispute, Ambassador Liu noted that "a trade war" is not inevitable. The history has proved time and time again that there is no winner in a trade war. China does not want a trade war, but China is not afraid of it. Facing with the America's breach of the rules, China has no choice but to safeguard its own legitimate rights and interests. In the meantime, China's door to negotiations and consultations is always open. Recently, a high-level US delegation visited China and had a constructive discussion with the Chinese side, which is the first meaningful step. The Ambassador hoped that the two sides would continue to negotiate, which is in the interest of China, the US and the whole world. As staunch defenders and strong advocates for free trade, China and the UK should join hands to fight against all forms of protectionism, and to promote investment liberalization and facilitation so as to build an open global economy. Regarding intellectual property rights (IPR) protection, Ambassador Liu briefed the editors on the progress of China's IPR protection, emphasizing that IPR is the driving force behind innovation which in turn is essential to reform and opening-up in China. China is further improving its IPR management system. The public awareness of IPR protection and application in China has been notably enhanced. China is also strengthening cooperation with the world on IPR protection. It is absolutely wrong for the US to disregard the facts and impose trade sanctions against China on the pretext of IPR. Ambassador Liu also shared his views on the opening up of China's financial industry, the corporate debt issue, the situation of Korean Peninsula, and Iran's nuclear issue.